If you want to learn more about SQL in a classroom setting, you could consider attending a Wise Owl course; otherwise, see the rest of this comprehensive SQL tutorial. 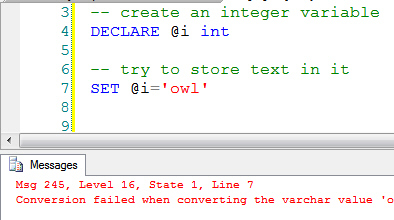 There are 6 standard error functions in SQL - each is described in more detail below. This page uses this error message as its example. You can see the various bits of information about the error more clearly here. On my instance of SQL Server 2008 R2 this gives 98,318 error messages, while on SQL Server 2012 it gives 230,186. I'm not sure if this means that the later version can generate more errors! Where a % sign appears it means that a message's text can vary (as explained in the final part of this blog). Error message enthusiasts might like to use the system stored procedure sp_AddMessage to add their own messages to those stored in the Sys.Messages table. Here the web has gone down, so we raise an error to reflect this. Because we haven't given an error number, 50000 is assumed. There's more detail on raising your own error messages at the end of this blog series, including using the new THROW command. 0-10 These are regarded as warnings by SQL Server, and don't trigger error trapping (so, for example, they won't transfer control to the CATCH clause of a TRY / CATCH block). 11-18 Error message severity levels that you can use. 19-25 These are severity levels reserved for error messages generated by members of the sysadmin fixed server role! Any severity level of 20 or above is regarded as fatal by SQL Server. There's not a great deal to say about this. It's provided as a way of distinguishing between two messages with identical number. To all intents and purposes it always takes the value 1, and is of no interest. If you want to prove this to yourself, have a look at Microsoft's take on the subject. This gives the name of the procedure or trigger in which the error occurred, where there is one (otherwise, it returns Null). What follows is an example to illustrate where this might be useful. The error occurred in the spSub procedure, but is reported from spMain. What this shows is that if an error isn't captured in a called procedure, it will bubble up to the one which called it. 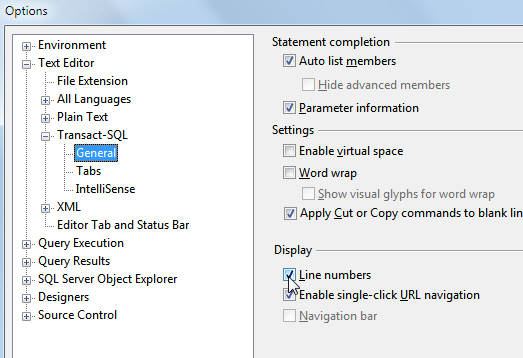 Tick the Line numbers box in the Transact-SQL General tab. Here the error occurred on line number 7. As mentioned earlier, however, by far the easiest way to find an error is just to double-click on the offending line! The text of error messages is the most useful part of an error, but there's not much more to say about it here! Now that we've covered the parts of an error message, let's have a look at a practical example showing the use of error-handling in SQL.